If you’re looking for a really creative hen party activity that everyone can get stuck into, mobile jewellery making hen party sounds right up your street! Perfect for a more relaxed experience, this crafty activity is sure to give you a unique party to remember, and have all your friends and family laughing and creating some beautiful accessories. Every girl likes some jewellery, so why not create your own statement pieces and really personalise rings, necklaces and earrings as a fun party idea. This creative hen party provides a laid back, relaxed atmosphere as we’ll do everything for you. Our professional workshop leader will be on hand to give you some tips and tricks in creating the best looking jewellery and give you some examples for inspiration. The professional will also bring everything you might need for your mobile jewellery making hen party, including different coloured glass beards, pearls and of course some Swarovski crystals to add some sparkle! You have the freedom to make your jewellery to match any outfit (maybe even your hen night outfit) or just go wild and create something completely unique and beautiful, it’s totally up to you. The whole session lasts around 2-3 hours, giving everyone enough time to have a little bit of practice, choose all the materials and decorations they love the look of and then make some glamourous jewellery. All of your creations can be taken home as a memento of the unique hen party day, and we’ll provide a pretty presentation bag to keep your jewellery safe if you’re not already wearing it. 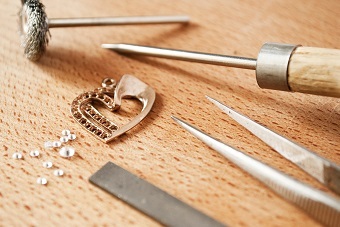 If all of this wasn’t enough for your bride to be, the jewellery making activity is completely mobile! This means we will bring everything you need to your chosen venue, whether that be a holiday cottage, a hotel you’re staying in or even your own home. This makes the party idea effortless and stress free for you, all we need is 15 minutes to set everything up beforehand and then you can have a fabulous hen party to remember. Does the mobile jewellery making hen party sound perfect for your special day? If so let our events planners help you organise everything and call us on 0161 341 0052 to start planning your dream hen party.